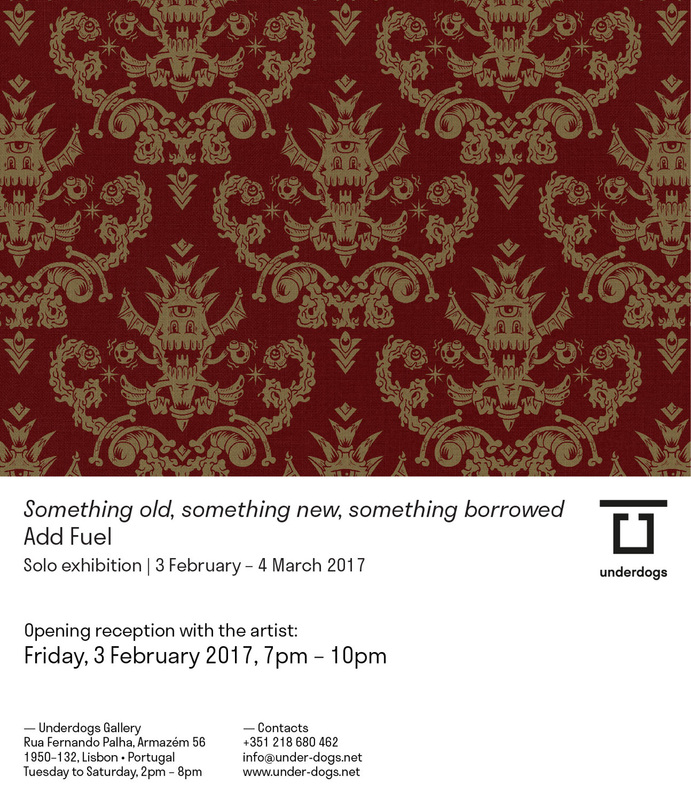 Underdogs Gallery is proud to present “Something old, something new, something borrowed”, a solo exhibition by Portuguese visual artist Add Fuel in Lisbon, Portugal. Based on the practice of articulation and reinterpretation that has characterised his artistic activity, Add Fuel presents in “Something old, something new, something borrowed” a staging of an intimist nature arranged in a type of idealised and stylised domestic se ing – part genuinely cosy, part openly satirical –, that suggests a narrative of decorative contours that aggregates a multiplicity of references, iconographies, and signs which, in one way or another, have contributed towards shaping his personal and artistic identity. Inviting the viewer to enter a space charged with symbolic elements, from the more obvious to the more covert, that con gure the multiple realities and readings which give life to the artist’s personal universe, “Something old, something new, something borrowed” essentially speaks of personal records and comforts, of the past and the present, of what was and what is – a series of re ections that convey a repertoire of emotions, interests, and stories particularly important to the author: distant family recollections, but also recent intimate memories; pleasant reconnections with domesticity a er long periods of travel in the real world, but also disconnections and ironic provocations with the virtual world of social media; a long relationship with the universe of animation and video games, but also another with themes of classical representation from the history of art. His universe of seemingly irreconcilable referents that reveal the author’s personality is here materialised in a body of work that combines pieces of a di erent nature – large- and small-scale compositions that express a sophisticated dialogue between techniques and motifs both traditional and contemporary in origin. “Something old, something new, something borrowed” thus presents itself as a showcase of items where the game of contrapositions and replications that typi es Add Fuel’s original language is woven – one based on crossing artisanal methods, such as ceramic tiles or cross-stitch embroidery, with industrial and digital processes of production. Common to this authorial universe is the presence of multiple layers of signi cance that demand a close reading – a complex world of forms and figures that replicate and transform themselves under the gaze of the more a entive viewer. Exploring techniques of illusion and symmetrical repetitions that unfold in pa erned compositions, the result is a wi y and poetic harmony that tests the viewer’s visual acuity, seducing him to an intricate game that plays with his perception and the multiple possibilities of interpretation – of what is, but also of what appears to be.